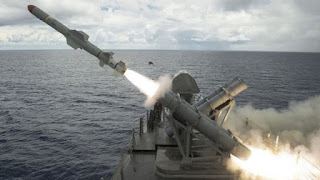 Against the backdrop of recent threats by North Korea launch ballistic missiles at Guam, the US Navy (USN) conducted a live-firing of the Boeing RGM-84D Harpoon Block 1C missile from a warship off the coast of the island territory on 22 August. The missile, which was fired from the Independence-class Littoral Mission Vessel USS Coronado (LCS 4) struck “a surface target at significant distance beyond the ship's visual range”, said the USN in a statement, without giving specific details of the target’s location. “ Coronado 's successful firing of the harpoon over-the-horizon missile system demonstrates the lethality of LCS while deployed overseas,” the service added. The USN also disclosed that an MQ-8B Fire Scout unmanned aerial system, and one MH-60S Seahawk helicopter were deployed in the firing to provide targeting support. Both aircraft are part of Coronado 's rotary-wing air detachment. Coronado is currently on a rotational deployment in the Asia-Pacific region. The vessel is the first LCS platform to deploy with an over-the-horizon anti-ship capability, given its four-cell launcher system that can deploy the Harpoon missiles. The weapon system, which was installed onboard the LCS in 2016, enables the ship to engage surface targets from a stand-off range of about 50 n miles, according to information from Jane’s Weapons: Naval. The RGM-84D BLOCK IC can be equipped with warheads of up to 221.6 kg (488 lb). The all-weather, over-the-horizon (OTH) weapon can be deployed against a range of surface objectives, and can approach its targets via either sea-skimming or low-apogee trajectories.